Check out the latest Sierra Wireless and Cypress Semiconductor earnings call transcripts. The Internet of Things (IoT) presents a massive opportunity for chipmakers thanks to the exponential growth in the number of connected devices. Mordor Intelligence predicts that the IoT chip market will exceed $15 billion in sales by 2023, up from $7 billion in 2017. Not surprisingly, chipmakers have been scrambling to invest in IoT-related technologies. After all, the mid-teens growth that this market promises would give them a big reprieve from the slowdown that they have witnessed in the past year. 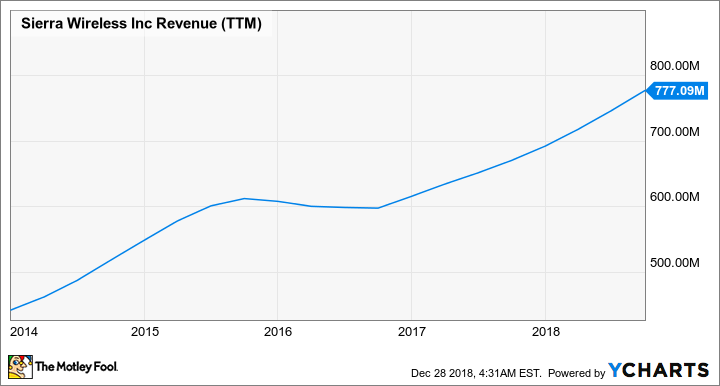 Sierra Wireless (NASDAQ:SWIR) and Cypress Semiconductor (NASDAQ:CY) are two such companies looking to the IoT to help them turn their fortunes after a tough 2018. One of these is a pure-play IoT specialist, while the other is a diversified player with interests across different verticals. Which of these two should investors be betting on from a long-term perspective? Let's find out. Sierra Wireless is a pure-play IoT specialist, selling embedded modules and gateways used for machine-to-machine (M2M) communications. Simply put, the company's chips integrate wireless connectivity into devices across several verticals including automotive, enterprise networking, industrial, residential. According to Strategy Analytics, Sierra controls a third of the global cellular IoT market in terms of revenue and comes in at third place in terms of volumes shipped thanks to its specialization in IoT technologies. That's a solid position to be in, as demand for cellular modules will go through the roof on the back of several catalysts, including connected cars, the continuing transition to 4G, and the advent of fifth-generation (5G) wireless networks. The global cellular IoT market is expected to clock a compound annual growth rate of nearly 22% through 2024. Sierra's solid position in cellular modules makes it one of the best bets to take advantage of this trend. And as it turns out, the chipmaker's dominant position in this space has already started paying off. SWIR Revenue (TTM) data by YCharts. This pick-up in Sierra's growth is probably due to the growing deployment of IoT technologies. Investors can expect this momentum to continue in 2019 thanks to a ramp up in the deployment of Sierra's products in automotive, as well as the growing demand for low-power wide area (LPWA) networks critical for the deployment of IoT. The company is also seeing massive growth in enterprise solutions and IoT services, its high-margin businesses. These two businesses together supply 27% of Sierra's total revenue, and their combined revenue increased almost 90% year over year during the third quarter. As such, enterprise and IoT services could be big catalysts for Sierra in the new year and beyond, as they are a play on the secular growth of the IoT space as a whole. Unlike Sierra, Cypress Semiconductor is not an IoT specialist. It is a much more diversified company with interests in memory controllers, storage chips, and connectivity. Investors looking for a diversified play on IoT could consider taking a look at Cypress, as the company is aggressively branching out with a slew of product development moves. For instance, the chipmaker recently announced that its cloud connectivity offerings for IoT solutions are now compatible with Alibaba's IoT operating system. This means that developers can design products based on Cypress' programmable chips -- which aim to deliver long battery life, robust connectivity, and security -- for Alibaba's cloud computing arm. Smart homes are yet more fertile ground for Cypress. The chipmaker has unveiled a number of smart-home connectivity applications over the past year to power products from leading providers of smart-home devices. The company's automotive business has also been growing at a faster pace than its overall revenue thanks to its foray into fast-growing niches, such as advanced driver assistance systems (ADAS), yet another application of IoT. All in all, Cypress is looking to turn itself into a major connectivity player. That's why the company recently offloaded its cyclical memory business to better focus on the connectivity business, as that division carries higher margins. Cypress' gross margin has increased 5.2% percentage points in the first three quarters of fiscal 2018, while operating margin has increased by 2.1%. 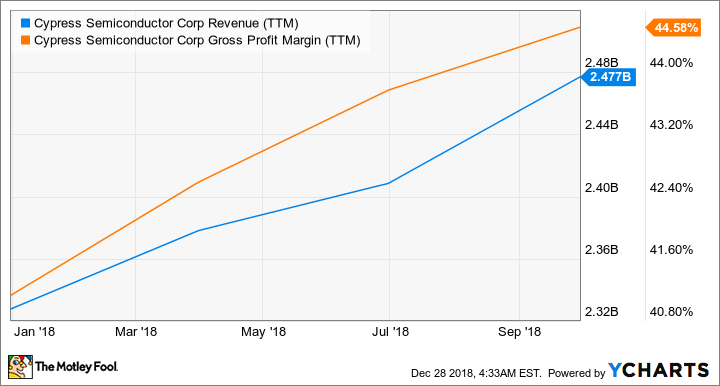 The company managed this impressive margin growth on the back of an 8.7% increase in revenue, and posted a profit -- compared to a loss in the same period last year. CY Revenue (TTM) data by YCharts. So Cypress is carrying stronger earnings power thanks to its pivot toward the connectivity business, and IoT is playing an important role in this transformation. Clearly both Cypress Semiconductor and Sierra Wireless are making the right moves to boost their financial performance. Moreover, the two stocks aren't too expensive when stacked against each other: Sierra has a forward price-to-earnings (P/E) ratio of 14.5, while Cypress is cheaper with a forward P/E of 9.3. However, Cypress has a solid forward dividend yield of nearly 3.6%, while Sierra doesn't pay a dividend. What's more, Cypress is committed to returning half of its free cash flow to investors in the form of dividends and buybacks. As such, there's great scope for Cypress to boost its dividend thanks to its focus on increasing revenue from higher-margin operations, which is why it looks like a more rewarding bet.